In ages 7-13, we offer a traveling program through the Big West Fastpitch League. A focus on competition and developing skills will be strongly emphasized. Traveling teams are formed of our best players to compete with the best players from other communities in the metro area. Our goals are improvement in team and individual skills, emphasizing teamwork, equitable participation required, and exemplary sportsmanship. If number of participants dictates, we form multiple teams per age level, with an A-B-C. Teams are formed at the 8U, 10U, and 12U levels. Division eligibility is not based on the player's age and year of birth .... NOT school grade. PITCHERS & CATCHERS - You must also complete a pitcher and/or catcher evaluation. This applies to 10U Travel and 12U Travel only. Please plan on attending an evaluation slot on both days. Tryouts for Traveling Teams are held in conjunction with Chanhassen Softball evaluations. Tryouts are mandatory. We require that ALL players attend ALL rounds of travel tryouts unless an excuse is approved, IN ADVANCE, through the Travel Director. All teams are final once they are posted. Players are assigned to a team based on the skill and performance level determined by the tryout staff and in evaluations from previous head coaches from traveling teams. All decisions by the tryout staff are final. All players who try out may not be selected to a traveling team. We may need to cut players to obtain the proper roster size. Players cut will have the opportunity to play in-house program, or we will work with our neighboring associations to find a Travel team she can join. Players who have registered for tryouts and cannot participate due to an injury or illness will be excused upon delivery of a doctor's note describing the player's limitations. Players excused due to injury or illness must present a signed doctor's release indicating that the player is medically fit before they will be allowed to participate in any Chanhassen Athletic Association activities. Players who miss the scheduled tryout sessions due to illness or injury will be assigned to a team in the lowest offered team. The tryout staff and the Chanhassen Athletic Association Baseball/Softball Board will determine this, with input from past coaches. Recognizing that individuals will have different skills and needs, a positive environment will be created to foster contribution, accomplishment, confidence and a feeling of self-worth in all players. Each participant will be treated fairly and know they are an important part of the team. All contributions are valued. 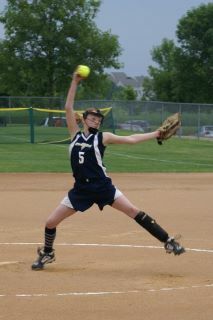 In turn, players must make the Chanhassen Softball team they are placed on their sports priority for the season. Equal playing time is required and enforced, however coaches are afforded a degree of latitude to temporarily reduce time for players who display a distinct lack of commitment to the team. Coaches are required to communicate the specific reasons for time reduction to the player and parents in a respectful manner, and to work with the player to help rectify the situation quickly. Coaches must keep the respective Softball Director of Traveling informed of any reduced time situations. Emphasis is on skill development, teamwork, cooperation, sportsmanship and respect for others. Winning is not the primary focus, however, competing and striving to win are emphasized at a minimum the following travel team opportunities. Teams are selected to ensure that both the team and individual development needs are best served at the appropriate level of competition. The teams are selected to ensure that the talent distribution on each team is appropriate and well balanced. Team formation differs slightly at each level of play and requires the judgement of the team selection committee for optimal results. The team selection committee uses the tryout results and previous-year coach evaluations as input for individual team placement. The intent is to roster each team with 10-12 players (11 is ideal). 8U This league was developed to encourage players who are ready for more than Machine Pitch, but who are too young for 10U fastpitch. 8U Fastpitch is sanction the same as our 10U, 12U and 14/16U fastpitch leagues through the 8U Tri-County and Suburban League. 8U games are played by the same rules as 10U fastpitch softball – striking out, 3 outs an inning, etc. (no stealing) and there is travel to various locations around the Twin Cities. Coaches focus on the fundamentals of softball: throwing, catching hitting, base running. Players still hit off of a pitching machine. 10U. Teams are formed to ensure each team has pitching experience on par with the overall team level of play. The teams will be formed to ensure that the distribution of talent on each team is appropriate such that the team and player development goals are achieved. Each team is fielded with pitching experience. Tryout results, grade, and previous travel experience are considered in team formation. It is recommended that players have one year of in-house player pitch division and/or fall ball experience prior to participating on the 10U travel teams. Teams bat their entire roster and have overall equal playing time. Players will typically play 3-4 positions throughout the season. Week-day games are focused on player development versus a "must win" mentality. Tournaments are more competative and coaches will often reduce player rotation. Coaches are focused on developing the pitching skills of at least 3-4 players through the season. Teams have 2-3 events per week, a combination of practices and games. Teams primarily play their games on Mondays, but it is possible to play games on Tue or Wed due to scheduling. Teams participate in weekend tournaments: three tournaments, League Qualifier tournament, MMFL State, and NAFA National (if it qualifies). 12U. Team level is set at different levels (A, B, C) depending on the overall team competitive level. Individuals are rostered to teams based on ability as demonstrated during the tryouts and previous-year coach evaluation. Teams bat their entire roster and have overall equal playing time. Players will typically play 2-3 positions throughout the season. Week-day games are focused on player development versus a "must win" mentality. Tournaments are more competative and coaches will often reduce player rotation. Teams have 2-3 events per week, a combination of practices and games. Teams primarily play their league games Mon-Thur. Teams participate in weekend tournaments: three tournaments, League Qualifier tournament, MMFL State, and NAFA National (if it qualifies). • Teams are selected to ensure that both the team and individual development needs are best served at the appropriate level of competition. The teams are selected to ensure that the talent distribution on each team is appropriate and well balanced. Team formation differs slightly at each level of play and requires the judgment of the team selection committee for optimal results. The team selection committee uses the tryout results and previous-year coach evaluations as input for individual team placement. • Top 8 evaluated players from evaluation day automatically make the first team. • After first team is selected, next highest 8 evaluated players automatically make the second team. • The pitchers will be ranked by evaluations. The top 2 pitchers will automatically make the first team even if the either pitcher is not in the top 8 overall evaluated players. If a pitcher is not in the top 8, they are counted as one of the manager’s picks. • A pitcher who evaluates on the second team or lower as a pitcher, but makes a higher team as a position player has the option to play for the higher team. That team is not required to have that player pitch if they choose to play on the higher team. There is no guarantee that this player will pitch. • A pitcher can opt to play with the second or lower team where she will be one of the 2 starting pitchers even if she is an automatic top 8 pick for the first team. • A catcher can opt to play with the second or lower team where she will be one of the 2 starting catchers even if she is an automatic top 8 pick for the higher level team. • A catcher is not automatically placed on a team as part of their catcher evaluation. The catcher's team selection is based on their overall player evaluation. In order to remain a traveling softball association in good standing in the state of Minnesota, Chanhassen Softball adheres to Suburban League. These guidelines can be found by visiting www.suburbanleaguemn.com/ . Chanhassen Baseball/Softball will not support Renegade Teams with equipment or field time, nor approve or support Renegade Teams in any State Tournament. A Renegade Team as defined by Chanhassen Baseball/Softball is a person or team that did not initially try out for a Chanhassen Baseball/Softball Travelling Team, or is not playing on an In-House team. This policy pertains to participants in ages 10-16 for Softball. • Provide programs that are cooperative with, and respected by, other community programs. 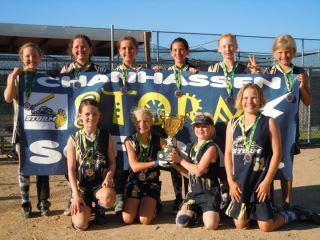 If a team needs an extra player due to a schedule conflict, sickness or injury, the player must come from within the Chanhassen Softball Association. The head coach has the option to select the player, pending the approval of the Director of Traveling and Director of Softball. The coach will select from the next level down in the same age group. If no one is available, they are then allowed to proceed to the next age group down, or to Chanhassen Softball In-House. The Chanhassen Baseball/Softball Board must be notified when any use of this policy is put in place. · Tournament registration fees including 3 tournaments, League Qualifier, State and gate fees. · NAFA National registration fee and gate fee. Does not cover gift bag nor pin expenses. Registration for 8U, 10U and 12U Storm Fastpitch Softball is held between January and February. The preferred registration method is online at www.chanathleticassociation.com. Flyers are available through the schools and the Chanhassen Recreation Center. Players must provide a copy of their birth certificate with picture identification at registration. • Previous youth coaching experience, including feedback from prior seasons. • Attendance and active participation in coach and player clinics. • Ability to represent CAA with the utmost respect and sportsmanship. • Ability to provide positive reinforcement to players in both practices and game situations. • This must be the coaches’ top priority and only traveling team. The West Metro Thunder is a softball partnership between Chanhassen and Chaska community softball organizations. Our goal is to create an opportunity for girls to play competitive fastpitch softball but without the year long expense and time commitment of club teams. We will form as many teams as possible based on number of interested players. In 2010, WMT fielded two 16U teams that played in Suburban League B. WMT Blue won MMFL B State and qualified/played at NAFA in Shoreview. In 2011, WMT fielded three 16U teams that played in Suburban League A (one team) and B (two teams). WMT Black qualified for Nationals and played in the NAFA Nationals in Omaha NE. Plans for 2012 include fielding three teams again. Our goal is to take players who are freshmen/sophomore/JV players and give them an opportunity to continue playing summer ball without the intense practice/tournament schedule of many Club teams, and for a fraction of the price since we are community based teams. Many if not all of these girls will continue on with high school ball, and A/B level competition at 16U is highly competitive. ½ of our teams are aging up to 18U’s this year, and we need players trying out at all positions. All players from any community are welcome with the majority of the players expected to come from the 3 community areas. Tryouts are held in Aug. Team selection is determined by the tryout results and coach/committee input.